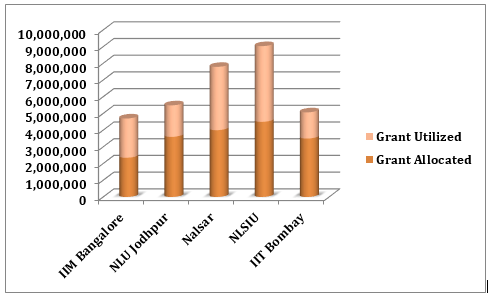 A wide variation in the allocation of funds among different Universities was observed. Further, it was noted that no information was available on any platform, regarding the actual utilization of these funds, and therefore, CIS had filed a Right to Information request for the same with the concerned authorities. Documents regarding all matters related to finance and budget related to the MHRD IPR Chair under the IPERPO Scheme for 2013-14 established across different Universities. Utilization Certificates & Exp. Stmts. The RTI Requests were returned by NUJS Kolkata as well as IIT, Kanpur, in a response dated 28.11.2014. IIM Ahmedabad in its response (dated 9.12.2014), informed of the fact that no MHRD IPR Chair has been established under the IPERPO Scheme at the institution. Details of the activities undertaken by the MHRD IPR Chair, as well as their finance and budget allocation were received from IIM, Bangalore (dated 16.12.2014). It was disclosed that the focus of the IPR Chair is on research on the economic and management dimensions of IPR with special reference to the corporate, SME and agricultural sectors. Since 2011-12, the Chair has focused on creative content management and protection with reference to cinema, electronic media and classical performing arts. Several activities were undertaken by the Chair, including finalization of a Research Monograph; inclusion of IPR Economics into the Core Course in Microeconomics for the Post Graduate Programme in Software Enterprise Management; a National Workshop on “Macro Policy Environment, IPR’s and Competition Policy” was organized; and 2 Research Assistants were appointed under the Chair. Against a request for Rs. 26,10,000, a grant of Rs. 23,50,000 was received, utilized for the payment of the Chair’s salary (Rs. 19,20,000), RA honorarium (Rs. 5,40,000) and Round Table Expenses. IIT, Delhi, in its response (dated 16.12.2014) informed that no MHRD IPR Chair has been established under the IPERPO Scheme at the University. Further, no grant money has been received by the University under the Scheme. NLU, Jodhpur submitted a detailed reply (dated 16.12.2014). A number of IPR research and learning initiatives have been undertaken under the MHRD IPR Chair established under the IPERPO Scheme, including IPR Awareness Programmes, formulation and conduction of various undergraduate and postgraduate IPR Courses, research and suggestions on IPR Law Reforms and IPR Policies etc. NLU Jodhpur conducted a training session for researchers and teachers of IPR, a workshop for students on IP Litigation, a conference on “The Impact of IPR on Access to Medicine”, Training, Sensitization and Outreach Programmes as well as lectures and paper presentations. Funding received from the grant was utilized towards payment of the coordinator’s salary (Rs. 5,78,800) RA honorarium (Rs. 6,00,000), Ph.D. fellows’ honorarium (Rs. 3,38,000), travel grants (Rs. 2,00,000) and miscellaneous expenditure. A total of Rs. 17,00,000 was spent on sensitization and outreach programmes, workshops, conferences as well as the IP Depository. The University of Madras in its response (dated 29.12.2014) submitted that no MHRD IPR Chair has been established under the IPERPO Scheme and no grants were sanctioned to the University. The requisite documents detailing expenditure incurred (Rs. 37,88,349) as well as the financial budget were made available by NALSAR University of Law (dated 22.12.2014). Expenditure was incurred towards the payment of the Chair Professor’s salary (Rs. 17,50,093), payments to the staff (Rs.7,11,544), the IPR Journal (Rs. 40,000), Travel (Rs.6,45,864), books (Rs. 2,67,740) and other miscellaneous expenditure. A link to an online report, was also made available. However, this is a dead link. The website established for MHRD IPR Chairs itself is not functioning. No information has been made available by Jawaharlal Nehru University, Delhi University, Delhi School of Economics and Tezpur University as well as CUSAT, Kerala as of now. Further, IIT, Kharagpur in its reply (dated 17.12.2014), sought exemption from providing the required information under Section 8(1)(d) of the RTI Act, 2005. IIT Bombay, in its reply (dated 15.01.2015) submitted that having established a MHRD IPR Chair under the IPERPO Scheme, activities such as research, training, academic courses (Introductory Foundation Course at U.G., P.G. Level, Elective Course at P.G. Level), conducting workshops, conferences and outreach programmes and maintaining an IP Depository have been undertaken. Details about budgetary allocation were also made available. From a grant of Rs. 35,00,000, a total amount of Rs. 15,66,179 has been utilized. 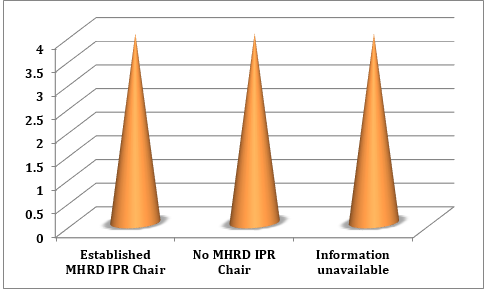 However, there was no IPR Chair for the year 2013-14. Out of a cumulative grant of Rs. 1,95,00,000 received till March 31, 2014, the institution has spent a total of Rs. 1,62,60,265 on IPR Activities, workshops, honorariums, salaries, conferences etc. from 2007. Lastly, as per the information received from NLSIU, Bangalore (dated 14.01.2015), an MHRD IPR Chair has been established at the University. Several activities have been organized at NLSIU, including a Workshop on IPR in S.J.R. College of Law, the release of an IP Newsletter publication “March of the IP Law”, a conference on the Advantages of Madrid Protocol, a conference on Patents, Innovation and Trade Secrets for MSMEs in IT/ITES Sectors in Karnataka, research activities such as the Fact-Screening-and-Transforming-Processor Project, the release of a website http://iprlawindia.org which is currently under construction, conducting awareness and outreach programmes etc. The MHRD IPR Chair at NLSIU was awarded a grant of Rs.45,00,000 which was largely spent on the payment of the Chair’s salary (Rs. 24,17,378), RA honorarium (Rs. 5,88,415), workshops and conferences (Rs.1,27,805), creation of a depository of IP books (Rs. 1,00,105), publication of newsletters (Rs.1,00,000) and staff payments. It is therefore observed that firstly, there was a variation in replies to the RTI queries filed under the same format, with some Universities providing information, some blatantly refusing to do so (IIT Kharagpur), and some delaying the process for what appear to be minor procedural irregularities. Four Universities have still not sent the requisite information, whereas no MHRD IPR Chair has been established in four of them. Only four replied with some information. Moreover, for the year 2013-14, MHRD allocated a grant of Rs. 1,79,50,000 among 5 Universities, disproportionately (ranging from Rs.23 lakhs-Rs. 45 lakhs per University). Out of this grant, the Universities have incurred a total expenditure of Rs. 1,41,23,021, largely for the payment of salaries of the IPR Chair (Rs. 66,66,271), honorariums for Research Assistants (24,50,183), and conducting workshops, conferences and travel for the same. 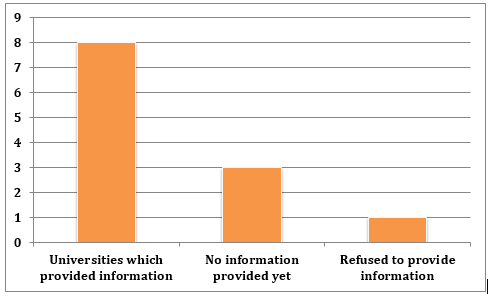 The various responses received to the RTI queries filed reveal a great variation in not just the allocation of funds by the Ministry, but also on the utilization of these funds (if at all), as well as in the range of activities conducted by the Chairs. We're still tracking this. Watch this space for more, including copies of our RTIs and the responses as well as details from other Universities who are yet to get back to us.